A new editor doesn't have to cast about very far for something to say; his first two duties are plainly to look briefly backwards and then to 'set out his stall' (does the phrase ring a bell?). First, the Editor is dead; long live the Editor! So be it, but of course the lady is not dead, only retiring from this chair in order to concentrate on her own writing and on the exceptionally demanding task of being head of the English department at Lampeter; Belinda Humfrey remains a member of the Editorial Board, and the New Welsh Review, of which she is the founding mother and virtually sole creator, will continue to benefit from her advice and help. In the three years since she gathered about herself a team of supporters from the Welsh Academy and the University's Association for the Study of Welsh Writing in English to persuade the Welsh Arts Council to fund the new journal, her achievement has been great, and I think all those in Wales and outside it who have had anything to do with NWR will wish me to record our gratitude to her for her dedication and success in a very difficult, time-consuming and not always sufficiently appreciated job. Looking to the next three years, the new editor begins with the premise that he must do his best to maintain the standard of excellence set by his predecessor. That does not of course preclude some possible changes, perhaps in emphasis, perhaps in range of interest, perhaps in style; I should like to think that we can attract a rather wider audience than we have done in the past, and I look to new writers, young and old, to make their advances to us, and to new readers to enjoy what we have to offer and to join in more vigorous debate about the issues of the day. My aim is to continue to publish the best stories and poems we can find, to go on running good articles about literary matters, and to have the most comprehensive, thoughtful and entertaining possible reviews of new books, covering everything of particular interest to Welsh readers as well as a wide cross section of new novels, poems and critical books written in English from anywhere in the world where matters of moment to the English language are happening. In addition, I propose to investigate the notion that literature does not stop with the written word; put simply, the core of all writing is story-telling, and fiction in dramatic forms  theatre, film, television play  always has a written basis of interest to readers; we shall therefore keep an eye on what is happening, particularly in Wales, in those media, and find some space to consider issues arising in them. It further seems to me that the books we read are things in themselves of great interest, and I hope to find writers eager to explore the hinterland as it were of literature: the lives and work of our publishers, book designers, booksellers, librarians and all who minister to our consuming desire for ever more literature in whatever form. 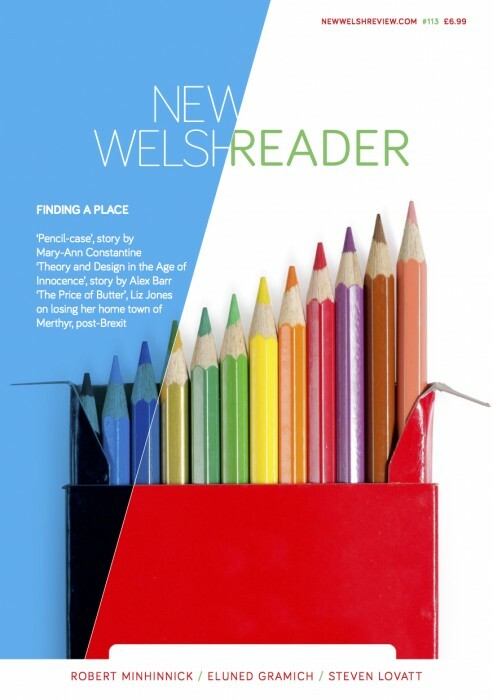 Then there is the matter of directly looking at language, our literary medium, English, its forms and possibilities, its relationship with Wales's other language, its use and mis-use, its endless variety, its supreme challenge. On this topic too, commentary and debate will be invited. The future of the magazine depends more on its readers than on its editor. We need more of you, and we need you to respond more overtly to what you find in NWR's pages. We shall find space to print letters to the editor whenever correspondence arrives that is sufficiently interesting, challenging, thoughtful, amusing or provocative. And we hope that you will always feel that the magazine is accessible, and that the editor is glad to have your ideas and to hear your opinions. It is a pity to have to finish with a businesslike word, but it is important to point out that the price at which you can subscribe to NWR at the moment is an extraordinary bargain (£12 per annum barely covers the printing costs, never mind paying the contributors!). We are bound to have to increase the cover price soon, probably to £3.25 or more. The moral is, subscribe now, and get your friends to do the same.